Like a favorite childhood toy (or those jeans from college), sometimes we simply outgrow the things we love most. 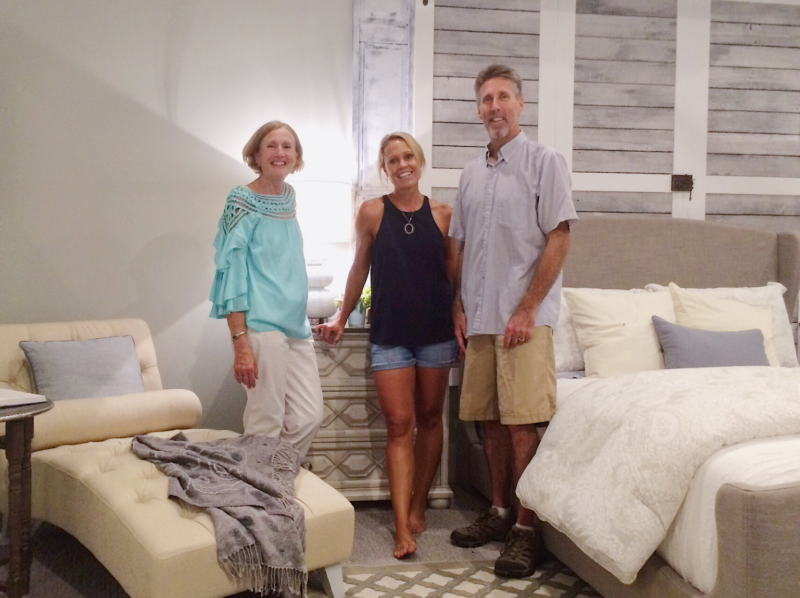 My clients, Eileen and Scott, were beginning to feel that way about their beautiful beach home in Lewes, DE. The couple had owned the home for years, and had fond memories of summers spent there with their two daughters. 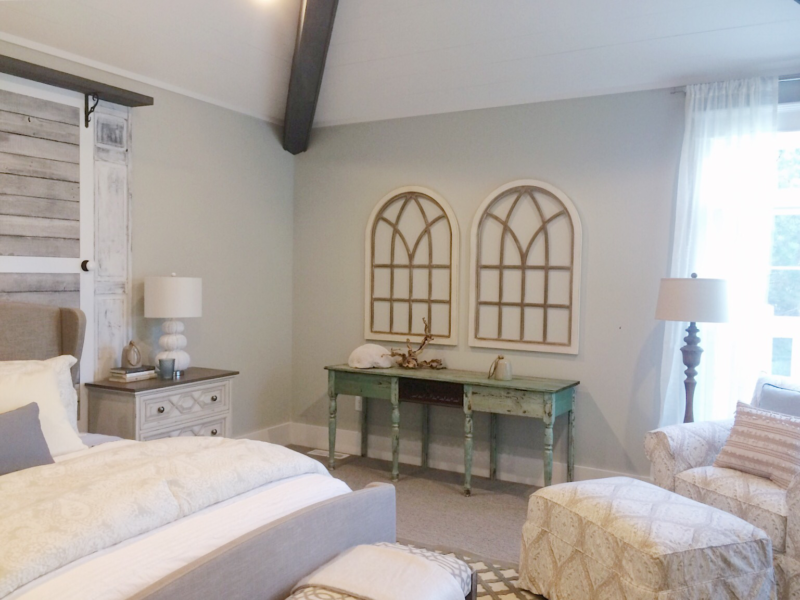 The location couldn’t be beat – it was close both to the beach and historic Lewes Village. But now, their daughters have all grown up and the home was starting to feel like it just didn’t fit anymore. The idea of selling the home and all its history had been floated around, but everyone was so attached that they just couldn’t bring themselves to do it. It was up to me to make a home that could fit their growing family. Lewes is a beautiful little beach town with a ton of history, and the homes here reflect that. Homeowners, like Eileen and Scott, take a lot of pride in the care and presentation of their homes, and want to honor the town’s history as much as possible. It was important in this renovation to create new spaces that would make the home livable, but with elements that felt like they had always been there. 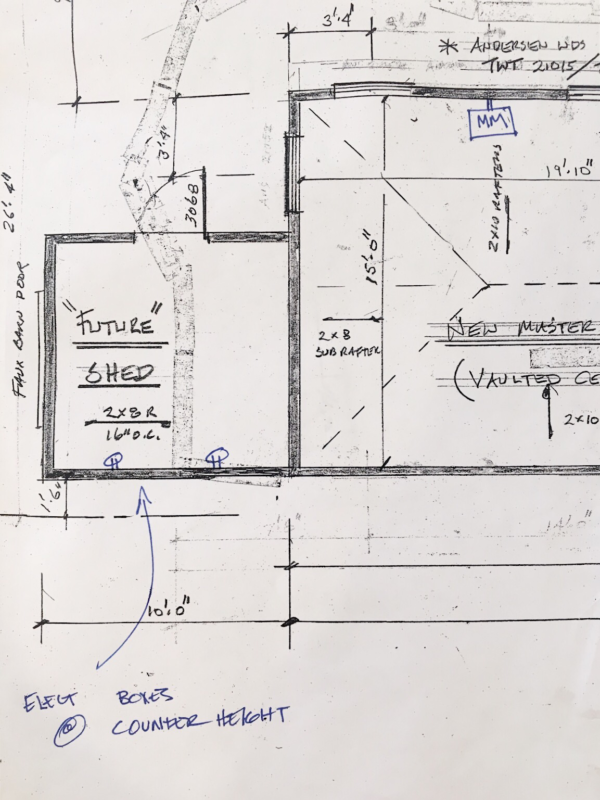 A little repurposing, a little creativity, and a little more elbow room were all this home needed to satisfy the family’s needs for generations to come. Problem: The home really didn’t have a dedicated master suite. Eileen and Scott were using the largest bedroom, but it didn’t have a bathroom and it was upstairs with the other bedrooms. 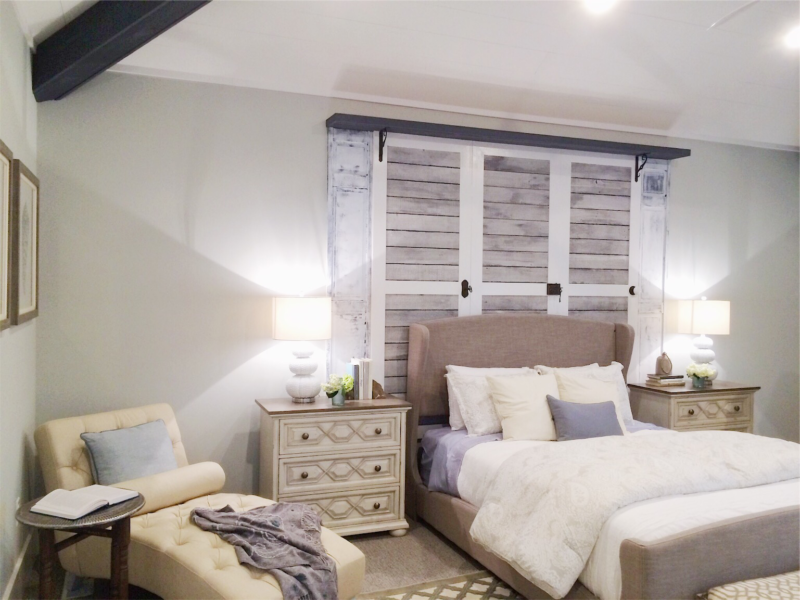 They dreamed of a private retreat where they could relax and wind down after spending time with family and friends. 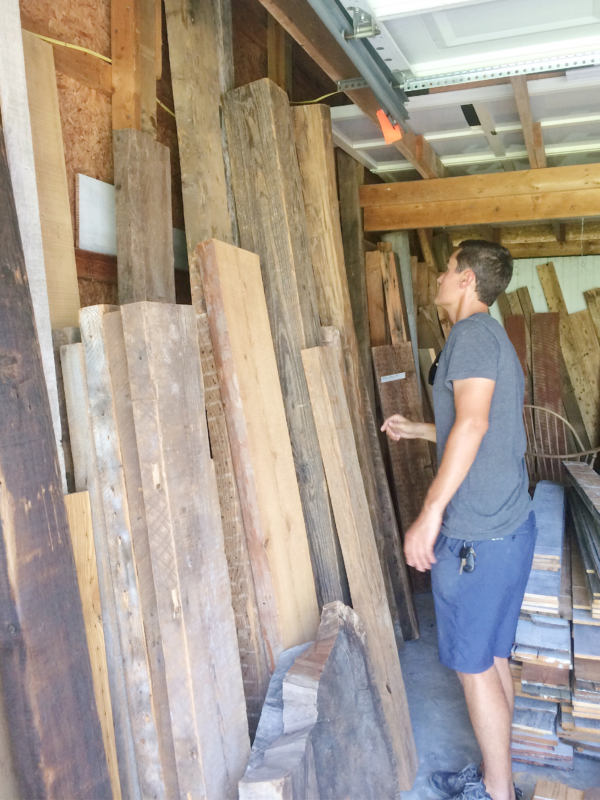 At the lumber yard with my brother, picking out wood for the home’s new (but old) beams. 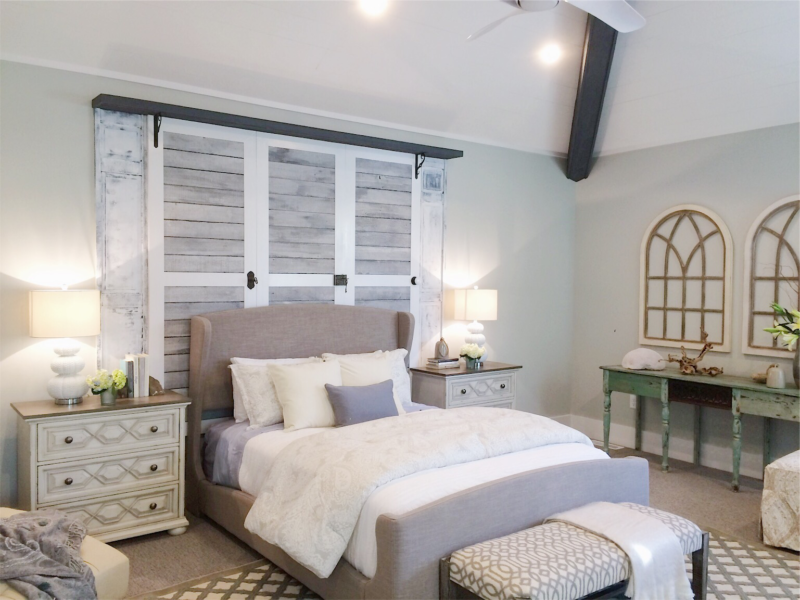 Solution: There simply wasn’t enough space in the home’s current footprint to create the master suite the couple wanted, so the only answer was to build it! We created a whole new addition to the back of the house with large windows to take in the beautiful garden view. 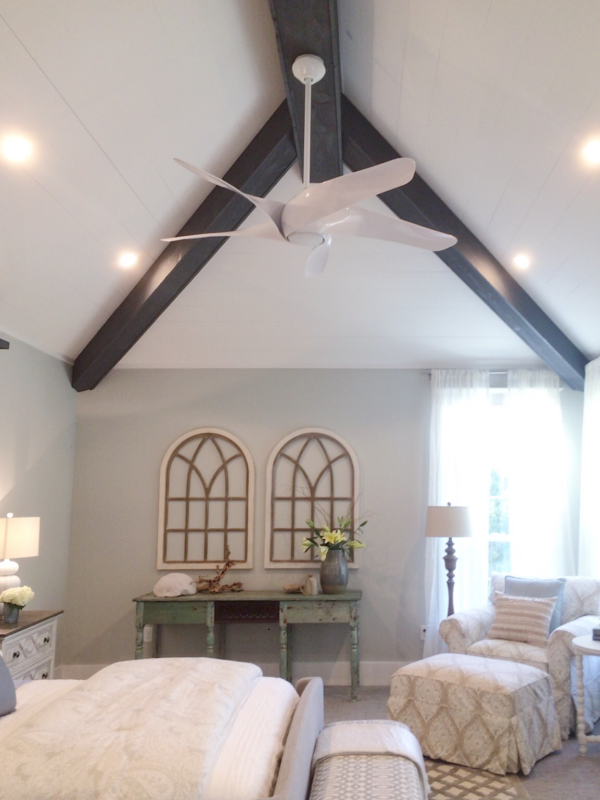 A vaulted ceiling covered in shiplap makes the new space feel airy and grand, while beams add contrast and interest, as well as draw the eye up. 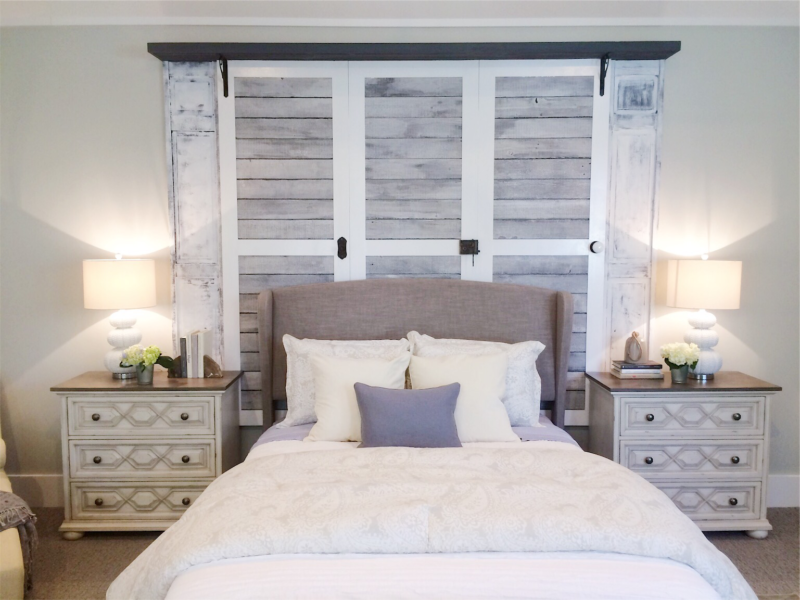 The bedroom needed a focal point, so I built a custom headboard out of door panels that I added reclaimed wood to in order to impart a sense of age and history. 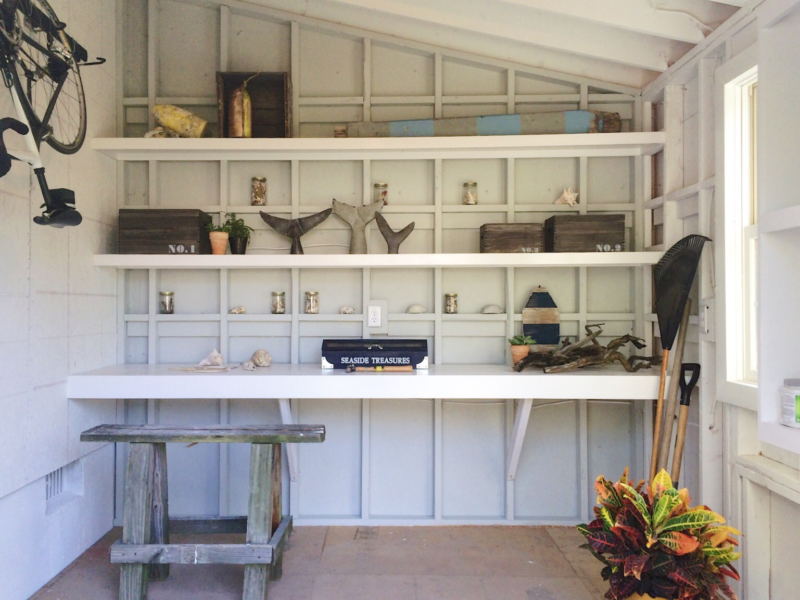 Lastly, I painted the walls a light teal to give the whole room the ocean vibe everyone loves at the beach. Every master suite needs a great master bathroom! For Eileen and Scott, I wanted to create a space that felt luxurious, but still casual enough for a coastal home. 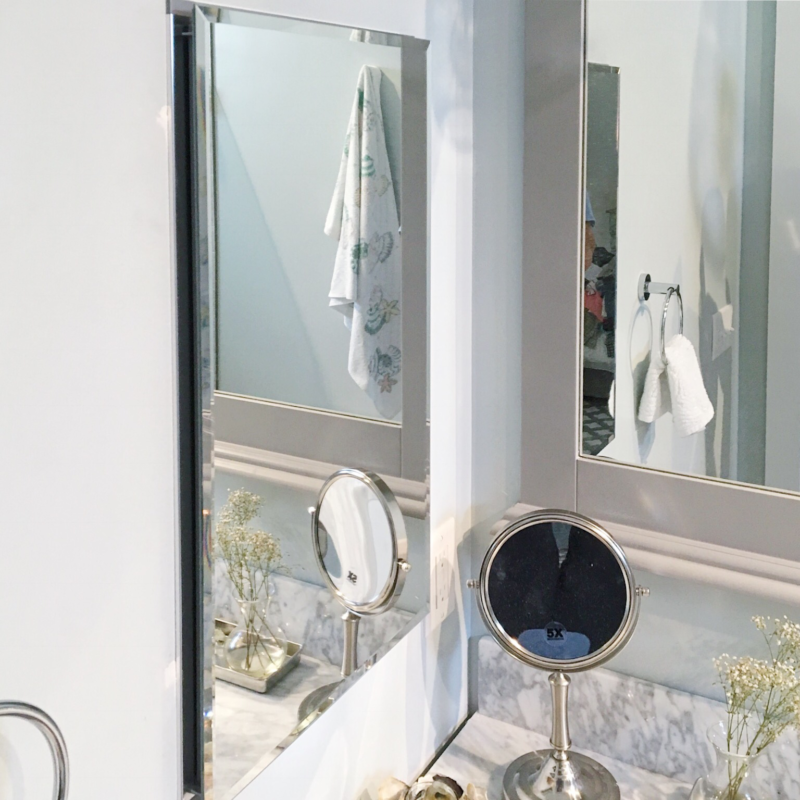 I continued with the ocean-inspired hues of the bedroom, and added luxe details like this amazing mirror/medicine cabinet. 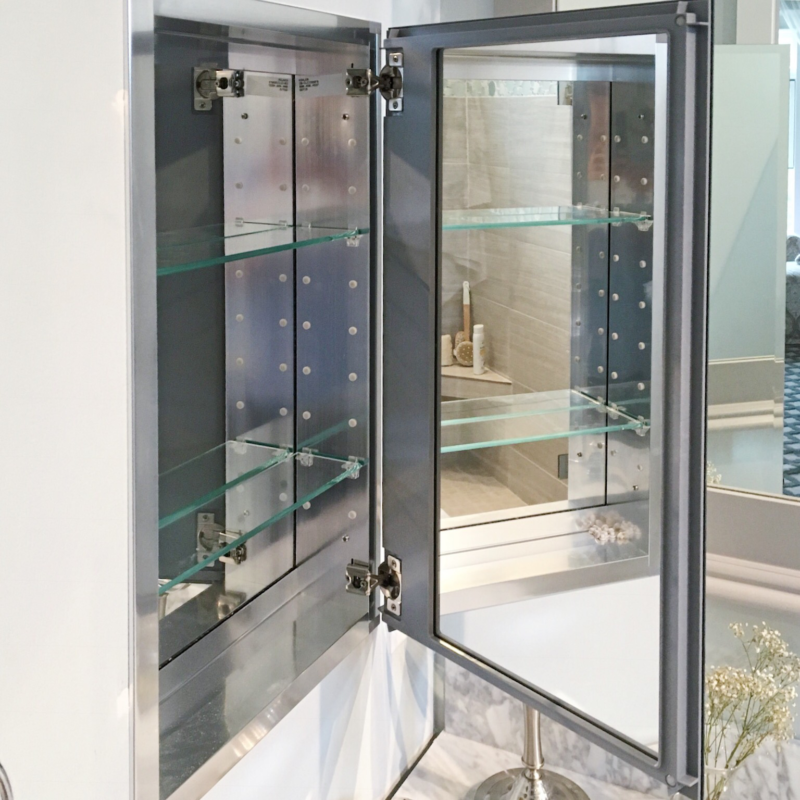 The shower is outfitted with a sleek, modern tile and a band of accent tile to tie back to the color scheme of the rest of the space. 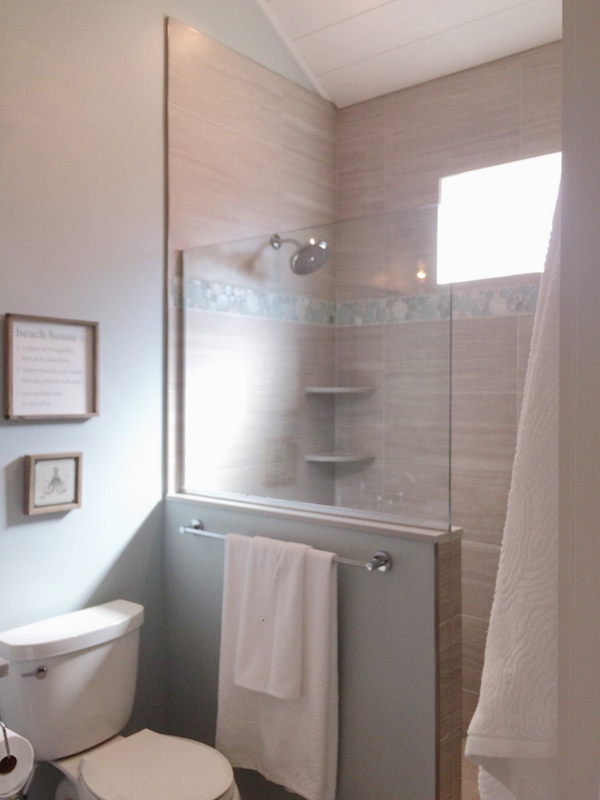 And finally, I made sure to install a window in the shower – it’s the next best thing to actually showering outside! Problem: Anyone who lives at the beach knows that sand will inevitably find its way into your home. But there are ways to cut back on the amount that tracks inside by providing guests with a place to rinse off and take off their shoes before coming indoors. Unfortunately, Eileen and Scott had no such space and didn’t have an outdoor shower (a beach house sin, if you ask me). Finally, their washer and dryer was located in the kitchen, using up precious space. Solution: Part of the new addition to the house included space for a laundry/mud room and an outdoor shower right outside it. We first laid new decking in the yard to make room for the shower. 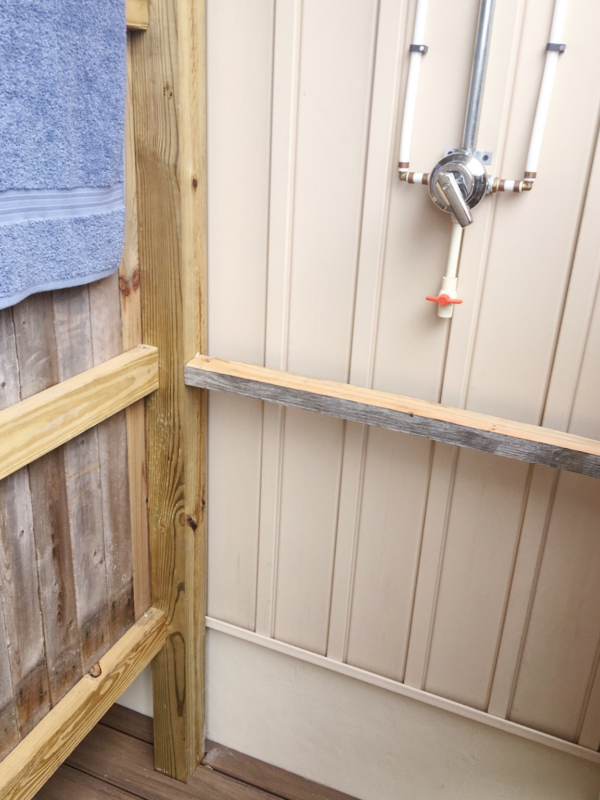 Then, we built the shower frame out of new wood to make sure it’s sturdy and safe. 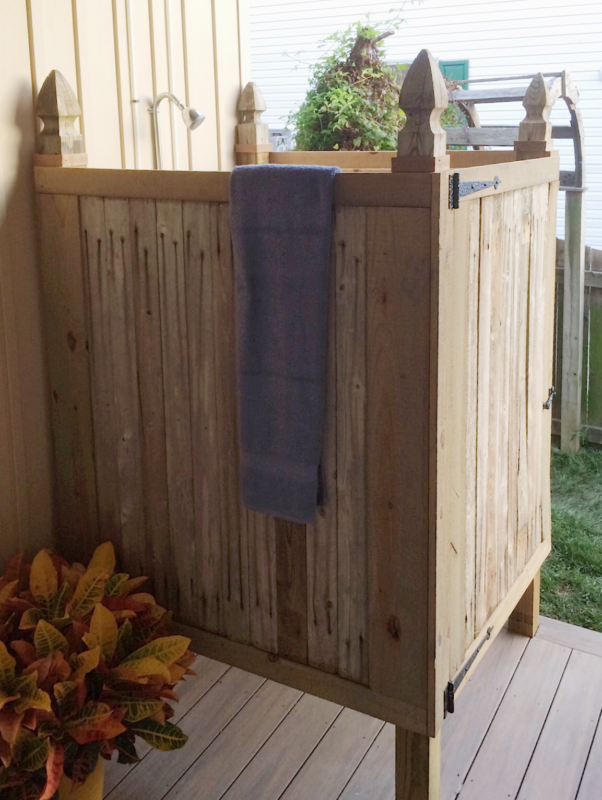 We then used salvaged wood fencing that Scott and Eileen has saved to clad the shower, giving it history and charm that new wood just doesn’t have. Not only was this solution sustainable, but it turned out really sharp, as well! 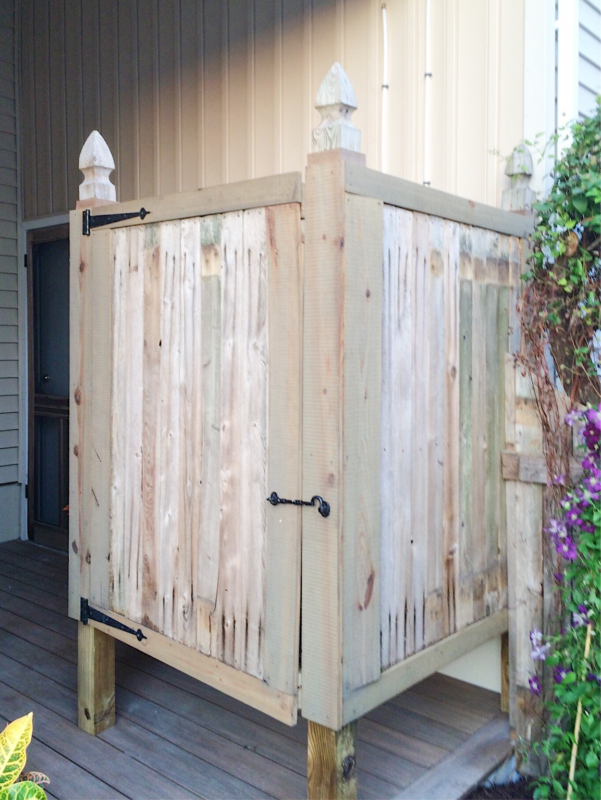 For the combination mud room/laundry room, we tied the plumbing into the outdoor shower and master bathroom. 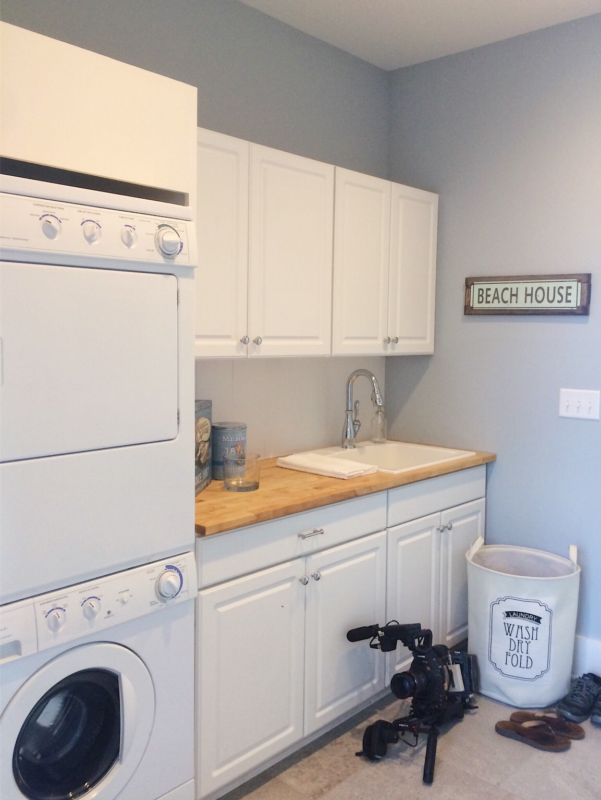 Moving the washer/dryer to this space freed up the kitchen and also created a convenient place to launder sandy beach clothes and wet towels. Because this is a space that will certainly see a lot of water, we tiled the floors. We also included plenty of storage and a sink to make it a one-stop shop for all of Eileen and Scott’s sand-containing needs. 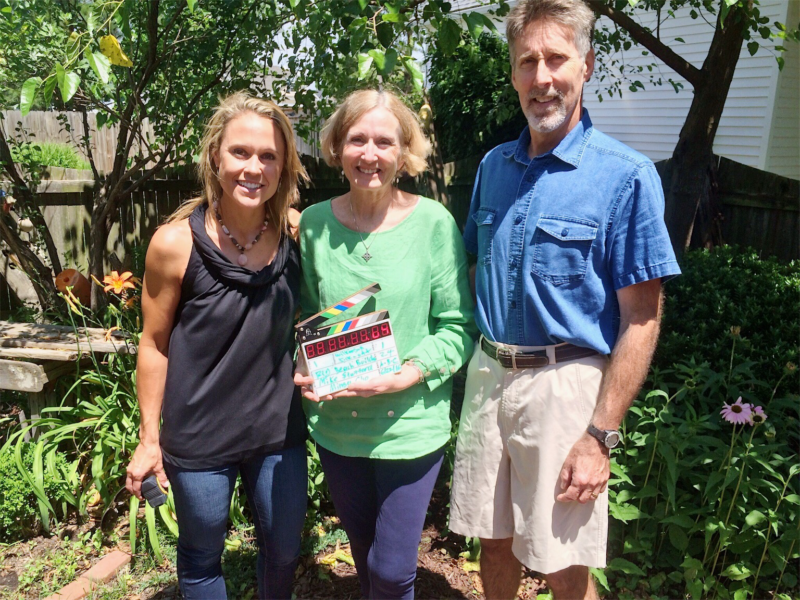 Problem: Eileen and Scott have a beautiful yard and garden, and when they aren’t on the beach, they love spending time improving their outdoor space. But they had nowhere to store their supplies or do their potting and planting. Solution: The final part of the new addition was a new shed. 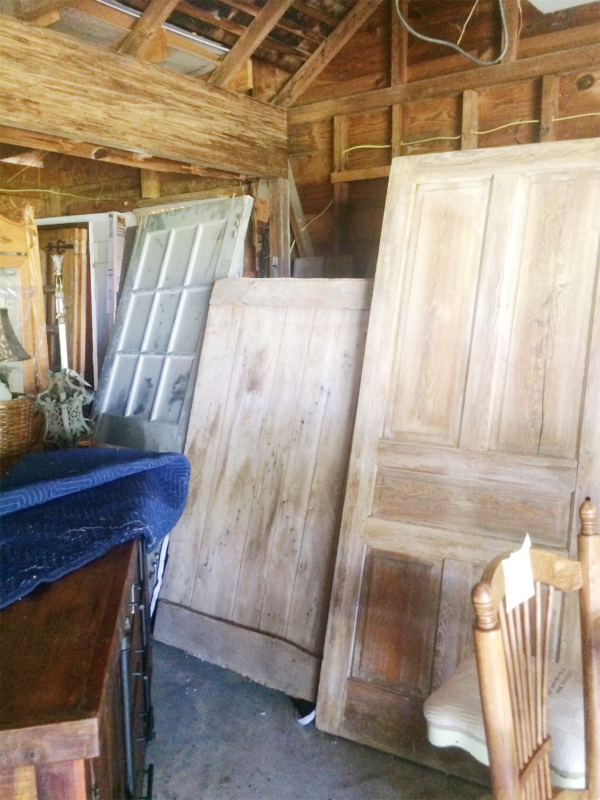 This sweet space has a large work surface for potting and pruning, shelves to display objects or store supplies, and a wide barn door entrance with a ramp to make moving large equipment in and out a breeze. A window lets in natural light so that even when the couple is working in the shed, they can still feel connected to the outdoors. 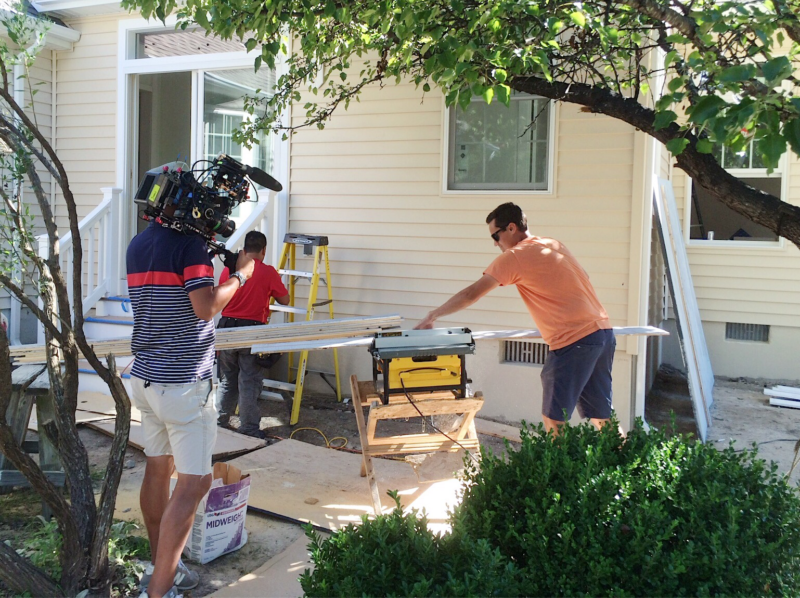 Lastly, we made sure to outfit the structure with plenty of electrical for lighting and power tools. The new space is a light, bright, and most importantly, functional space where Eileen and Scott can relax and and enjoy their gardening hobby. 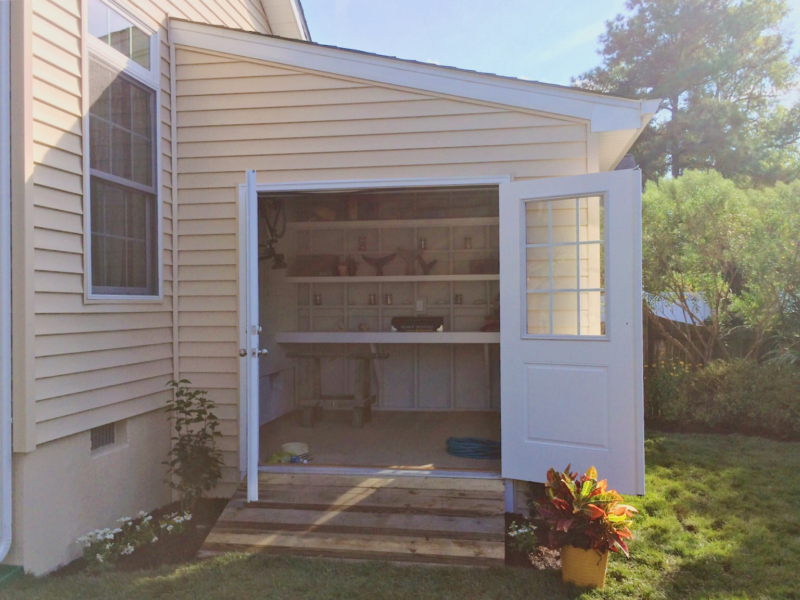 With the new addition we built, Eileen and Scott were able to add valuable and useful space to a home they’ve loved for years. But most importantly, the extra square footage meant they could now save the home instead of sell it to preserve the history they’ve already made there and continue making memories for years to come. And that’s what the beach is all about, anyway! 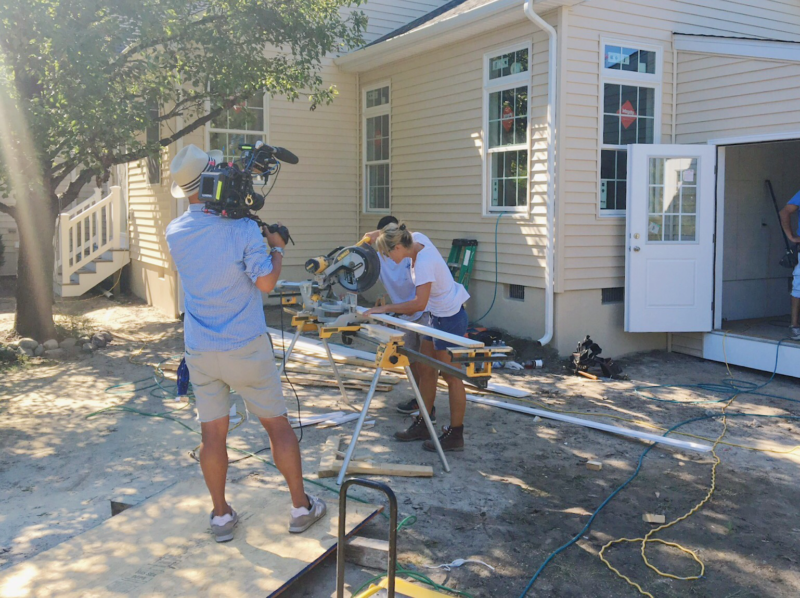 Well, that’s it for #BigBeachBuilds Season 1. Thank you so much for watching, sharing, tweeting, emailing, calling, texting, and supporting me in the million ways that you did. I couldn’t have done it without you! P.S. Go behind all the season 1 builds with my episode recaps!